Good morning everyone! 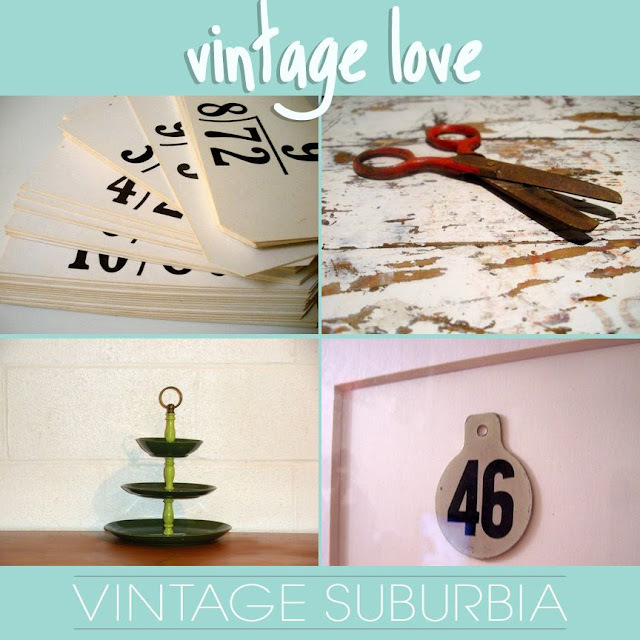 Today I am introducing another new weekly feature to the blog, Vintage Love. Each week I will feature a fabulous vintage shop and a short interview from the shop owner about vintage and thrift shopping and finds. Diane from Vintage Suburbia was kind enough to be my guinea pig as the first Vintage Love featuree. Diane gives some great tips on vintage and thrift shopping and her shop is full of charming, vintage housewares. Passing on items that others have loved and cared for. It's a form of recycling in my eyes and allows an item to have a home for just a little longer. A padlock in the shape of a heart, and the key was in the shape of an arrow. I didn't buy it and I really regretted it. I'm going to go back to the market where I first saw it in case the vendor still has it. This is one item that I would keep for myself, even though I know it would sell in my store. Do you have a style or method that you use when vintage/thrift shopping? There are so many places where I live (Reading, PA) to find vintage and antique items. So I can pretty much wander to any place and find something interesting. My only key is to not spend over a certain amount on each item. I don't want to have to sell something that is too expensive, all of my items should be affordable. Is there one tip you could share that might help someone who is new to vintage/thrift shopping? Be careful of overload! There's a ton of great stuff to look at and you can get sucked in real quick. Keep yourself to a certain amount per item if you are just out browsing. If you're looking for a certain item, stick to that item and have a price that you are willing to pay and do not go over that amount. Stick to your guns. And remember, vendors are sometimes flexible in antique markets and flea markets, there is (usually) room for negotiation. Thank you Diane for participating in this week's Vintage Love. Photos courtesy of Vintage Suburbia. great idea for a post! i've really gotten into vintage lately - i just wish we had better flea markets around us. thank god for etsy and great shops like this one!! Thanks! Thrifting is definitely my new favorite hobby!